Villa Essenza is a beachfront vacation residence that embodies contemporary tropical and coastal chic. Interiors are appointed with mostly complementary, modern, lavish as well as stylish furnishings and pieces. While amenities are deliberately first rate – for each and every guest’s absolute convenience and diversion. Built along Natai Beach, Villa Essenza accords you classy living with a truly peaceful, seaside air. The villa has six spacious bedrooms. Three of these bedrooms are on the second floor of the villa’s two-storey wing. The second-floor master bedroom has a double bed as well as an exclusive glass balcony with breathtaking ocean views. While the other two bedrooms – also on the second floor – have twin beds. At the opposite wing are three more bedrooms. The glassy master bedroom on this wing has a double bed as well as direct access to the infinity pool, the lawn and the beach. One other bedroom also has a double bed, while one more bedroom has twin beds. These two bedrooms open out to the infinity pool. All bedrooms have dedicated bathrooms with fitted bathtubs and rain showers. One of the master bathrooms, however, has a bathtub by large windows with views of the lawn and the beach. 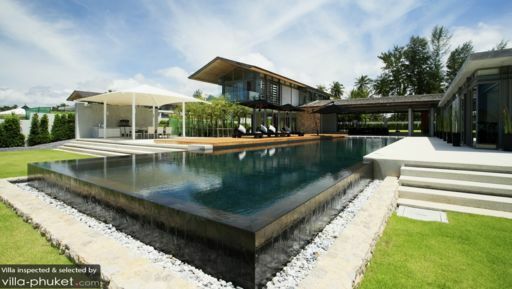 Approximately at the center of the expansive garden’s well-kept lawn is the 25-meter infinity pool. Dive into its alluring, crystal clear waters for your brisk, routine laps as well as for some playful splashing. 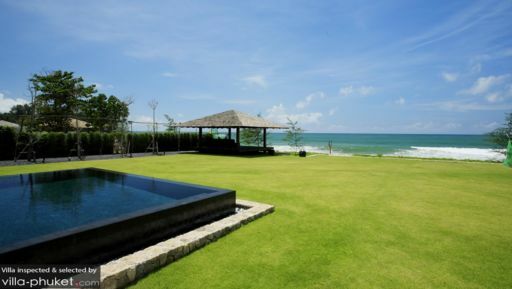 Then wade to the pool’s edge where you’ll certainly linger – entranced – as you gaze out to the Andaman Sea. For a breather, you can laze on the cushions and pillows of wooden pool beds partially covered by large umbrellas on the poolside wooden deck. At the villa’s spacious and airy main common area – surrounded by floor-to-ceiling sliding glass doors – is the living area with its hefty and long black couches that contrast with the interiors’ white color scheme. Here, you can all assemble for some amusing and animated sharing and storytelling. There are two dining areas. The indoor dining area – with its long, glass-topped table for 10 – is at the glass-walled ground floor of the villa’s two-storey wing. While the alfresco dining area – with its square table for 12 – is on the pool area’s stone deck. At any of these dining areas, you can feast on authentic Thai cuisine – as well as your most requested comfort food – concocted by the in-house chef at the fully-equipped, modern kitchen behind the indoor dining area. The kitchen also has a long counter which, provided with stools, can double as a bar. The alfresco dining and swimming areas are also ideal for cocktail and barbecue pool parties especially on breezy evenings. Adjacent to the living area is a media room where you can catch TV shows you’ve been closely following. Or, watch, for the nth instance, your all-time favorite classic film. At the edge of the garden is a sala where you can spend some alone time by the beach. Assigned to attend to the villa’s daily services is a staff headed by a manager backed by a personal guest assistant as well as by housekeepers and security personnel. In addition to the chef, a babysitter, a driver and a spa therapist may, upon your request, be called in. However, their services will be charged separately. Car rental is available. 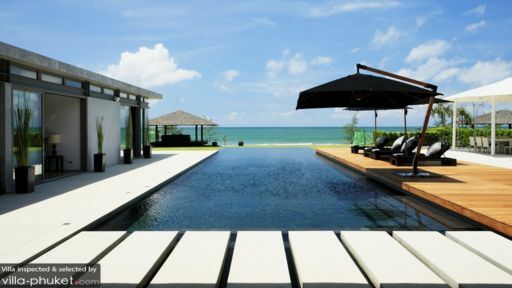 Villa Essenza is based along the pristine, white sand shores of Natai Beach within Phang Nga – Thailand’s princess province. From the villa, go on a day tour of the Sirinat, Ao Phang Nga and Khao Sok National Parks where you will find sea turtles, rich bio diversity as well as endangered species. Since you’re already at Khao Sok, you might as well stop by the Tsunami Museum and the Turtle Conservation Center. On another day trip, go kayaking on Phang Nga Bay – famed for its fascinating limestone pillars which jut out from the water – and head out to the Phi Phi Islands. You can also go diving at Shark Point as well as at the King Cruiser ferry wreck site. On a separate excursion, go sightseeing at Ko Panyi – an entire village standing on stilts, then catch the cultural and historical show at the Siam Namarit Theater. You may also want to take on the challenging course of the world-class Mission Hills Phuket Golf Resort. For a sample of appetizing Thai seafood specialties, highly-recommended are Rabian Lay Thai and Kok Kloy.